Twilight at Lyme Regis, United Kingdom. In common terminology, twilight is the time interval shortly before sunrise or right after sunset, when sunlight strikes the Earth's upper atmosphere and is scattered to illuminate the Earth's surface indirectly (at the observer's location). Twilight also refers to the natural light observed during those time intervals. 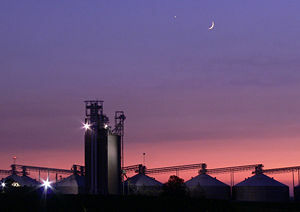 Twilight in the Midwestern United States, featuring Venus as a brilliant "evening star" and the crescent moon. Recognizing the romantic quality of the ambient light at this time, photographers and painters have referred to twilight as the "blue hour," after the French expression l'heure bleue. The collateral adjective of "twilight" is crepuscular. (For daylight, the adjective is "diurnal"; and for night, it is "nocturnal.") The term crepuscular is usually applied when referring to certain species of insects and mammals that are most active during that time. Technically, twilight is defined as the portion of the day during which it is possible to conduct outdoor activities without the aid of artificial light, beginning in the morning and ending in the evening. In this sense, the period of daylight (between sunrise and sunset) occurs within the period of twilight. From a scientific perspective, twilight is defined according to the position of the center of the Sun relative to the horizon. 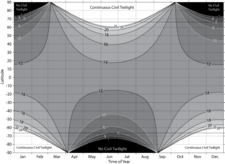 Based on this definition, there are three established and widely accepted subcategories of twilight: civil twilight (brightest), nautical twilight, and astronomical twilight (darkest). The specific positions of the Sun for each of these subcategories are given in the table below. For these definitions, an ideal horizon 90° from the zenith is used. The altitudes of the Sun below the horizon are "true geometric" altitudes, that is, refraction by the atmosphere and other small factors influencing the observed position of the Sun are not to be accounted for. Note that the angular diameter of the Sun is 0.5°. Also, if the Sun is 8.5 degrees below the horizon, it provides the same level of illumination to the surface of the Earth as a full Moon directly overhead. Under civil twilight conditions, the horizon is clearly visible and terrestrial objects are easily perceptible, without artificial light. Civil twilight begins in the morning when the geometric center of the Sun is 6° below the horizon (the point of civil dawn), and ends at sunrise. Evening civil twilight begins at sunset and ends when the center of the Sun reaches 6° below the horizon (the point of civil dusk). During civil twilight, the unaided eye can observe the brightest stars and also planets such as Venus (which is known as the 'morning star' or 'evening star'). During this period, there is enough light from the Sun that artificial sources of light may not be needed to carry on outdoor activities. This concept is sometimes enshrined in laws, as when drivers of automobiles must turn on their headlights, or if the crime of burglary is to be treated as nighttime burglary, which carries stiffer penalties in some jurisdictions. A fixed period (most commonly 30 minutes after sunset or before sunrise) is typically used in such statutes, rather than the number of degrees the Sun is below the horizon. Civil twilight can also be described as the limit at which twilight illumination is sufficient, under good weather conditions, for terrestrial objects to be clearly distinguished. At the beginning of morning civil twilight, or end of evening civil twilight, the horizon is clearly defined and the brightest stars are visible under good atmospheric conditions. This is defined as the time that starts when the Sun's geometric center is exactly 6° below the horizon (the end of civil twilight) and ends when the Sun's center is exactly 12° below the horizon. At this time, sailors can take reliable star sights of well-known stars, using a visible horizon for reference. The end of this period in the evening, or its beginning in the morning, is also the time at which traces of illumination near the sunset or sunrise point of the horizon are very difficult if not impossible to discern (this often being referred to as "first light" before civil dawn and "nightfall" after civil dusk). At the beginning of nautical twilight in the morning (nautical dawn), or at the end of nautical twilight in the evening (nautical dusk), under good atmospheric conditions and in the absence of other illumination, general outlines of ground objects may be distinguishable, but detailed outdoor operations are not possible, and the horizon is indistinct. Nautical twilight has military considerations as well. The initialisms BMNT (begin morning nautical twilight) and EENT (end evening nautical twilight) are used and considered when planning military operations. A military unit may treat BMNT and EENT with heightened security (i.e. a process called "stand to" in which everyone pulls security). This is partially due to tactics dating back to the French and Indian War, when combatants on both sides would use BMNT and EENT to launch attacks. This is defined as the time that starts when the Sun's center is exactly 12° below the horizon (the end of nautical twilight) and ends when the Sun's center reaches exactly 18° below the horizon. Most casual observers would consider the entire sky already fully dark even when astronomical twilight is just beginning in the evening or just ending in the morning. Astronomers can easily make observations of point sources such as stars, but faint diffuse objects such as nebulae and galaxies can only be properly observed beyond the limit of astronomical twilight. Theoretically, the dimmest stars ever visible to the naked eye —those of the sixth magnitude—will appear in the evening once the Sun falls more than 18° below the horizon (i.e. when astronomical dusk ends) and disappear when the Sun moves to within 18° of the horizon in the morning (when astronomical dawn occurs). However, due to light pollution, some localities—generally those in large cities—may never have the opportunity to view even fourth-magnitude stars, irrespective of the presence of any twilight at all. The duration of twilight depends on the latitude and time of year. Note the brief times in March and September where continuous civil twilight exists at locations near either pole. The length of twilight after sunset and before sunrise is heavily influenced by the latitude of the observer. In the Arctic and Antarctic regions, twilight (if at all) can last for several hours. There is no twilight at the poles within a month on either side of the winter solstice. At the poles, twilight can be as long as two weeks, while at the equator, it can go from day to night in as little as 20 minutes. This is because at low latitudes the sun's apparent movement is perpendicular to the observer's horizon, in addition to the fact that the orbital speed of a specific location is highest at the Equator and slower as latitude increases. Thus, a location on the equator will pass through the various twilight zones directly and quickly. As one gets closer to the Arctic and Antarctic circles, the sun's surface moves toward the observer's horizon from a lower angle and at a slower rate. The observer's earthly location will pass through the various twilight zones less directly, taking more time. At temperate-zone latitudes, twilight is shortest at or near both equinoxes, slightly longer around the time of the winter solstice, and much longer in late spring and early summer. Within the polar circles, 24-hour daylight is encountered in summer, and twilight literally lasts for weeks (in the polar fall and spring). In high latitudes outside the polar circles, 24-hour daylight is not seen, but twilight can extend from sunset to sunrise, a phenomenon often referred to as 'white nights'. Above roughly 60.5°N or S (e.g. Anchorage, Yellowknife, Salluit, Oslo, Stockholm, Helsinki, Tallinn, Saint Petersburg, Surgut and Jakutsk), civil twilight lasts all night at midsummer, while above about 54.5°N or S (e.g. Belfast, Glasgow, Hamburg, Copenhagen, Gdańsk, Vilnius, Moscow, Omsk, Novosibirsk and Edmonton), nautical twilight lasts all night at midsummer. Astronomical twilight can last all night for several weeks as far from the poles as 48.5°N or S (e.g. Vancouver, Winnipeg, Matane, London, Frankfurt, Prague, Kraków, Kiev, Karaganda, Blagoveshchensk and Punta Arenas). ↑ 1.0 1.1 Rise, Set, and Twilight Definitions. Astronomical Applications Department, U.S. Naval Observatory. Retrieved January 21, 2009. ↑ Winter Solstice on Mars: Rovers Look Forward to A Second Martian Spring. NASA Jet Propulsion Laboratory. Retrieved January 21, 2009. Mateshvili, Nina, et al. 2005. Twilight sky brightness measurements as a useful tool for stratospheric aerosol investigations. Journal of Geophysical Research 110 (D09209). doi = 10.1029/2004JD005512. Rise, Set, and Twilight Definitions. Astronomical Applications Department, U.S. Naval Observatory. Retrieved January 21, 2009. Sun or Moon Rise/Set Table for One Year. U.S. Naval Observatory. Calculate Sunrise and Sunset Times for Any Location. This page was last modified on 24 December 2015, at 16:12.